Now at the end of my task as editor of this book, I would like to share the two criteria by which I selected my co-workers. Firstly they were chosen because they are among the best in the field that they were asked to cover. Of course, I could have selected a few others who are also excellent research scientists, but this would duplicate the talents and introduce redundancies. I beg the indulgence of these colleagues and apologize for those were not included in the final short list of contributors. The second reason is the friendship that we have developed during all these years, meeting after meeting, during conferences, workshops, exchanging information, discussions, molecules, ideas, and in many cases drinking or dinning together. Obviously, any choice is questionable and spoiled by any bias of selection, but at the endpoint, it was a good one and I could not dream a better team. This mutual friendship meant that most authors instantaneously accepted my request that they participate to this stimulating project. The exceptional list of authors who immediately and enthusiastically agreed to contribute, meant that I had little extra to do to convince the very few who had too much work, to accept this additional task. This then meant that this initial task of inviting authors was quite easy. Later, I had to put some pressure on the shoulders of some of them to receive the chapters in due time. Finally this also was overcome. I have so much enjoyed receiving each the manuscript, reading it and realizing that each excellent contribution was exactly at the level of excellence and insight that I was expecting. I hope that you as readers of this book will have this same experience, especially the PhD students who are willing to learn something about these molecules, and for the experts, scientists or clinicians, who are looking for a strong basis for their knowledge and/or support for everyday clinical practice. In 1942, Deakins found that immature enamel contains 19%, by weight organic matter, and after maturation only 1.8% . This later value was further revised and it is now accepted that the enamel matrix does not contain over 0.6% organic matter by weight. In the early 1960s, it was shown that the transitory enamel proteins displayed a very special amino acid composition, including high proline content (approximately one quarter of all the amino acid residues), with glutamic acid, leucine and histidine being the other major amino acids. For these findings, tribute should be given to John Eastoe for his analysis of enamel proteins [2, 3]. The amino acid composition of the developing enamel matrix differs from either collagens or keratins. During maturation, these unusual proline-containing proteins preferentially disappear, whereas others disappear less rapidly and are partly retained in the mature enamel. Eastoe suggested that these transitory hydrophobic proline-rich proteins be called amelogenins (AMEL) . They are substantially different from the acidic matrix proteins found in mature enamel, termed "enamelins" (ENAM) by Mechanics in 1971 . This category of enamelin proteins was more recently termed "nonamelogenins", and including more recently identified matrix proteins; ameloblastin (AMBN) , enamelin (ENAM), tuftelin, and amelotin. 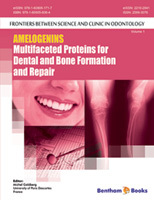 For years, amelogenins was only implicated in the formation of dental enamel, both in the nucleation of crystallites, and as a molecule exclusively expressed by ameloblasts. However during the last decade, it was found that amelogenins are multifaceted proteins. Though they play an important role during enamel formation, they must also be removed from the mineralizing matrix and are degraded immediately after secretion and later during maturation by two specific proteases MMP20 and KLK4 (see chapters 4 and 9). These degradation products include specific domains of the original amelogenins which may be refolded or otherwise form fragments that may also have a role in enamel formation. If these degradation processes are altered, defective enamel will be formed, leading to some forms of amelogenesis imperfecta (AI). Being a link between the extracellular matrix and the cell membrane surface, amelogenin may contribute to biological events as a member of the matricellular family. Amelogenins are also signaling molecules, acting on dental tissues formation during odontogenesis , primarily on secretory ameloblasts, but also on differentiating and mature odontoblasts [8, 9]. Moreover, it was discovered that amelogenin also interacts with bone cells, osteoblasts and osteoclasts . The concept that amelogenin is not entirely tissue specific is supported by the identification of this protein in non dental and non mineralized tissues. Therefore our views on the functions played by amelogenins have been substantially modified during the last few years. As a consequence there was a need to reviewing these new functions and aspects of amelogenins. New concepts have also arisen from studies on the role of amelogenins in biomineralization, and are still a matter of debate. Finally, amelogenins have been used experimentally for pulp therapy, periodontal healing and regeneration, and this third aspect needs to also be critically analyzed and evaluated. The first part of this book opens with a chapter devoted to the knowledge provided by lessons from evolution. From an evolutionary viewpoint, AMEL was created after an AMBN duplication, itself resulting from a copy of ENAM. The N- and C- regions were unchanged during evolution, whereas others were susceptible to be mutation, which in mammals lead to different forms of X-linked amelogenesis imperfecta. These different aspects are analyzed by Jean-Yves Sire in (chapter 1). The next eight chapters focus on the gene coding the amelogenin molecule, on cellular aspects in developmental biology, membrane receptors, and intracellular regulation pathways. This then leads to a review of amelogenin degradation and the consequences on enamel defects, namely AI. High levels of amelogenins are produced during the secretory stage of amelogenesis. The amelogenin genes have 7 exons, except in some rodents where 2 additional exons are found. Reports are made on regulatory regions of the gene and on alternative splicing of the primary RNA transcripts.. In many species, the amelogenin gene is nested within an intron of the Arhgap6 gene, generally in the opposite orientation (antisens). In addition, it has recently been shown that amelogenin mRNA and the coded protein are also detectable in several non-dental tissues. Megan Pugach and Carolyn Gibson summarize all these findings (see chapter 2), whereas Wu Li, Pamela DenBesten and their group report on the role of exons 8 and 9 in rodents (chapter 13). This chapter could have been chapter 3, but despite the chapter describes the functions of exons 8, 9, focusing mainly on basic rather than clinical applications, I decide to place this chapter as Chapter 13. The potential role of AMEL was evaluated experimentally by producing amelogenin knock-out mice, invalidating either the full length molecule or the leucine rich amelogenin peptide (LRAP). Ashok Kulkarni and his collaborators covered this part (Chapter 3). They show severe alterations in the enamel formed when amelogenins were absent, but still some disorganized enamel structures were formed, suggesting that other matrix proteins also modulate enamel formation. Going from the gene to the mRNA and from the mRNA to the protein, ameloblasts are implicated in the synthesis, secretion, intra- and extra-cellular proteolysis of amelogenins and non-amelogenin proteins. These molecules are obviously crucial in enamel formation, but have also the capacity to influence osteogenic events. The part, devoted to cell functions, is written (and beautifully illustrated) by Rima Waren, Sylvia Zalzal and Antonio Nanci (Chapter 4). Among the enamel non- amelogenin proteins, ameloblastin and enamelin are critical for the formation of enamel mineral ribbons. Yong-He Chun, Jan Hu and Jim Simmer brilliantly review the properties of these molecules and their interactions with amelogenin in chapter 5. The enamel matrix proteins bind a class of proteins called lysosomal associated membrane proteins (LAMP1, Lamp2 and CD/LAMP3). These molecules interact with the AP-3 complex to initiate receptor-mediated endocytosis. AP-3 dysfunctions lead to enamel abnormalities, described here by Michael Paine and his collaborators (Chapter 6). For years, we have teach our students that amelogenin was a protein specifically expressed by ameloblasts, characteristic of the phenotype of these cells, and involved as a transitory molecule in enamel formation. Deutsch and his co-workers [11-13] tell us now that amelogenin is also present in many other tissues. Amelogenins do not only play a major role in enamel formation but display other functions during the development of the embryonic craniofacial complex. They are recognized to act as signaling molecules. These additional properties lead to the exploration of the possible role on regeneration of tooth supporting tissues. Dan Deutsch and his collaborators review these biological aspects (Chapter 7). Establishing a link between normal and pathologic enamel structures, Timothy Wright has examined the consequences of amelogenin mutations on AI (Chapter 8). Finally, amelogenins and non-amelogenin enamel matrix proteins are degraded by two proteinases. MMP20 and/or KLK4 are implicated in the extracellular cleavage of enamel matrix molecules. Severe enamel alterations termed amelogenesis imperfecta are due to gene mutations of these proteinases (reviewed in chapter 9 by John Bartlett and his co-workers. The two chapters of the second part of the book are devoted to enamel mineralization, as a model for biomineralization. From the numerous published data, the potential role of amelogenin is far from yet being clearly elucidated. Dental enamel matrix proteins display a complex distribution within the matrix. Amelogenins seem to be widely distributed among the forming enamel crystals, whereas the non-amelogenins immediately surround the enamel crystal surface. The respective chemical properties of each of these molecules provide some evidence for functional specificities. For example, non-amelogenins (previously referred to as enamelins), are more effective than the amelogenins in retarding seeded growth of enamel apatite crystals . The role of amelogenin in promoting mineralization requires additional clarifications and perhaps implicates new concepts and technological approaches, as reported in this part of the book. Mineralization is concentration dependant, and amelogenin promotes in vitro nucleation at concentrations up to 6.5mg/ml but not at higher protein concentrations, whereas the amount of calcium phosphate is seen to decrease . Others have developed the concept that the hydrophobic portion of amelogenin plays a role as inhibitor of crystal growth . Despite numerous studies, data related to the function(s) of the leucine-rich amelogenin peptide (LRAP) in enamel biomineralization are conflicting. The conclusions of some reports are that LRAP does not control of apatite crystal growth , whereas for others, amelogenins regulate the nucleation, growth and organization of forming enamel . Janet Moradian-Oldak and Rajamani Lakshminarayanan, using very recent concepts, demonstrate that amelogenin belongs to the class of Intrinsically Disordered Proteins. They describe and characterize the conformational plasticity, the multi-functionality, the self-assembly properties and the specific interactions with other targets (Chapter 10). How amelogenins are implicated in biomineralization is not yet fully understood. The role of the full-length amelogenin in organizing the formation of amorphous calcium phosphate, how the molecule guide the organization of linear needle-like structure that subsequently fuse are clarified by Henry Margolis and Elia Beniash (Chapter 11). The third part of the book is focusing on the potential role of amelogenins [or enamel organic derivative (EMD)] as tools for dental and periodontal regenerative therapies. When Lars Hammarström developed with the Biora Company, he used purified porcine enamel matrix proteins in a product called Emdogain . The mixture contained mostly amelogenin but also a series of other molecules, including proteases. When this mixture of proteins was put on the market, the evidences for the presence of amelogenin in the Hertwig’s root sheath were weak and controversial, with conflicting reports among species, and therefore, the clinical application of amelogenin or EMD to periodontal regeneration was empirical and perhaps premature. Though these issues raised valuable questions, the product was found to work. We now have the answer to some of the questions related to the function of Emdogain in periodontal regeneration. In studies using recombinant spliced molecules such as A+4 or A-4, very similar to LRAP, or LRAP + the amino acids expressed by exons 8, 9, we were able to run in vivo and in vitro studies and shed some light on the actual effects of amelogenins, on cells of the dental pulp. These studies imply answers to questions related to how adult STEM cells or progenitors are recruited, and how they proliferate and differentiate. The cell differentiation processes or the expression of extracellular matrix molecules that play a role in dentin formation are implicated in dentin repair and pulp regeneration/mineralization. This strategy is applied to the dental pulp, bone and to the treatment of periodontal diseases. Studying the mechanisms regulating these processes, Arthur Veis and his collaborators draw attention to the fact that small spliced isoforms of AMEL participate to the development of dental tooth germs. During embryogenesis, they are also found in non-dental organs. Chapter 12 shed lights on cell signaling, membrane receptors, and on intracellular trafficking between the surface of the cells and the nucleus where after A+4 or A-4 stimulation, molecules implicated in biomineralization are synthesized. Additional data are brought by studies on exons 8 and 9, only found in rodents, that shed light on these therapies (see Pamela DenBesten et al., chapter 13). Altogether, these molecules are also tools for the repair of mineralized tissue (dentin, pulp, and cementum) and periodontal tissues. Most studies were carried out on in vitro models. In vivo some experimental approaches were performed by our group, with the active collaboration of Art Veis’s and Pam DenBesten’s groups, providing insights on the cascade of events and the cellular mechanisms that are involved on pulp repair (Chapter 14). I wish to thank them for their warm friendship, for sharing molecules and science, and their help in editing our chapter written in Frenglish rather than pure English. Additional chapters focus on the use of an artificial matrix created by nanotechnology in which amphiphilic peptides undergo self-assembly into nanofibers presenting biological signals to support cell proliferation and signaling properties to direct ameloblast differentiation. Such alternatives to traditional dental materials are extremely promising (see Malcolm Snead et al., chapter 15). Other projects have implicated LRAP and its signaling effects on osteogenic differentiation along the canonical Wnt signaling pathway. This approach allows bone regeneration as shown by a rat femoral critical size defect model (see Yan Zhou et al., Chapter 16). Finally, Anton Sculean and his collaborators (Chapter 17) present a critical and fair evaluation of the clinical effects of enamel matrix protein derivative (EMD) on periodontal defects on acute and chronic animal models, and from human case reports. Well-controlled studies demonstrate the improvements which may be obtained and underline the limits of the clinical applications of EMD. Answering these numerous points was the aim of this book, written to transfer and establish strong links between the basic scientific knowledge and the clinical approach. I believe that we have covered most of the burning scientific points, and this will be useful in the next future. Deakins, M.: Changes in the ash, water, and organic content of pig enamel during calcification. J Dent Res 1942; 21:429-35. Eastoe J. E. Organic matrix of tooth enamel. Nature 1960; 187:411- 2. Eastoe J. E.: The amino acid composition of proteins from the oral tissues - II The matrix proteins in dentine and enamel from developing human deciduous teeth Archs Oral Biol 1963; 8; 633-52. Eastoe JE. The chemical composition of bone and tooth. Advance Fluorine Res Dent Caries Prev 1965; 3: 5-17. Mechanic G. The multicomponent, re-equilibrating, protein system of bovine embryonic enamelin (dental enamel protein): chromatography in desaggregating solvents. in Tooth Enamel II, its composition, properties, and fundamental structure. Fearnhead RW & Stack MV, Eds., Bristol, John Wright, 1971 pp 88-94. Krebsbach PH, Lee SK , Matsuki Y, et al. Full-length Sequence, Localization, and Chromosomal Mapping of Ameloblastin- a novel tooth specific gene. J Biol Chem 1996; 271 : 4431-5. Bourd-Boittin K, Fridman R, Fanchon S, et al. Matrix metalloproteinase inhibition impairs processing formation and mineralization of dental tissues during mouse molar development. Experimental Cell Research 2005; 304: 493-505. Veis A, Tompkins K, Alvares K, et al. Specific amelogenin gene splice products have signaling effects on cell in culture and implant in vivo. J Biol Chem 2000, 275: 41263-72. J. Hatakeyama J, D. Philp D, Hatakeyama Y, et al. Amelogenin-mediated Regulation of Osteoclastogenesis, and Periodontal Cell Proliferation and Migration J Dent Res, 2006; 85 : 144-9. Deutsch D, Haze-Filderman A, Blumenfeld A, et al. Amelogenin, a major structural protein in mineralizing enamel, is also expressed in soft tissues: brain and cells of the hematopoietic system. Eur J Oral Sci 2006;114 Suppl 1:183-9. Haze A, Taylor AL, Blumenfeld A, et al. Amelogenin expression in long bone and cartilage cells and in bone marrow progenitor cells. Anat Rec 2007; 290:455-60. Gruenbaum-Cohen Y, Tucker AS, Haze A, et al. Amelogenin in cranio-facial development: the tooth as a model to study the role of amelogenin during embryogenesis. J Exp Zool B Mol Dev Evol 2009; 15, 312B(5):445-57. Doi Y, Eanes ED, Shimokawa H, et al. Inhibition of seeded growth of enamel apatite crystals by amelogenin and enamelin proteins in vitro. J Dent Res 1984; 63 : 98-105. Tarasevich B, Howard CJ, Larson JL, et al. The nucleation and growth of calcium phosphate by amelogenin. J Crist Growth 2007; 304: 407-15. Beniash E, Simmer JP, Margolis HC. The effect of recombinant mouse amelogenins on the formation and organization of hydroxyapatite crystals in vitro. J Struct Biol 2005;149:182-90. Habelitz S, DenBesten PK, Marshall SJ, et al. Self-assembly and effect on crystal growth of the leucine-rich amelogenin peptide. Eur J Oral Sci 2006; 114 Suppl 1:315-9. Margolis HC, Beniash E, Fowler CE. Role of macromolecular assembly of enamel matrix proteins in enamel formation. J Dent Res 2006; 85:775-93. Nakamura Y, Hammarström L, Lundberg E, et al. Enamel matrix derivative promotes reparative processes in the dental pulp. Adv Dent Res 2001; 15:105-7.